A reply to this Letter to the Editor can be read here: https://doi.org/10.1007/s00068-018-0952-5. This Letter to the Editor refers to the article available at https://doi.org/10.1007/s00068-017-0877-4. 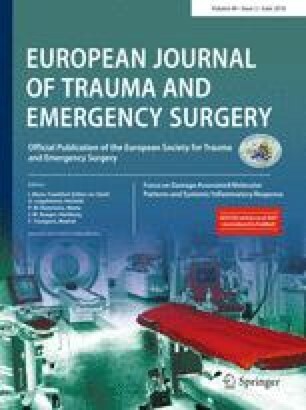 We read the article “Reduced invasive and muscle-sparing operative approaches to the posterolateral chest wall provide an excellent accessibility for the operative stabilization!”  with great interests. The authors applied cadavers in lateral decubitus position to the posterolateral chest wall to demonstrate ways to reduce invasive and muscle-sparing damages. This study provides detailed descriptions of the approaches to the fracture site and brings light to further management of rib fracture. A gap in practices currently exists in the management of the rib fracture. Traditionally, fixing a huge wound of multiple ribs creates damages to the muscle surrounding the injured site. The pain and dysfunction of muscles after operation serve as the obstacle to the development of rib fixation. The benefits of fixation seem to be countered by the complications of the huge wound. In our hospital, we try to minimize the wound of the fixation by applying titanium elastic nails (TEN)  to reconstruct the chest wall without plate and screws. TEN was originally designed for diaphyseal fractures of long bones in children . However, we only apply TEN on the fixation of anterior and lateral cage, which is one of the limitations to its use. During operation, we let the arm rise extensively to maximize the exposure of the poster wall. Yet, this method is less recommended to increasing the width of operative field with smaller wound. Most of the rib fracture from 4th to 10th can be fixed with mini-wound if the location is correct. With the video-assisted thoracoscopic surgery, the fracture site could be located more accurately without a wide wound. In conclusion, in the development of fixation of rib fracture caused by blunt trauma, minimizing the wound would be a key to decreasing the complications and increasing the operation. Although indications and materials used require further studies, with the surgical technique to minimize the wound, we believe with the applications of VATS [4, 5], rib fixation will be a further treatment to reconstructing chest wall for acute respiratory failure to decrease the mortality and pain . Yih-Wen Tarng, Tung-Ho Wu, Yi-Pin Chou and Hsing-Lin Lin declare that they have no conflict of interest.